This is 3D's first home tour of the new year and 10th home tour till date. 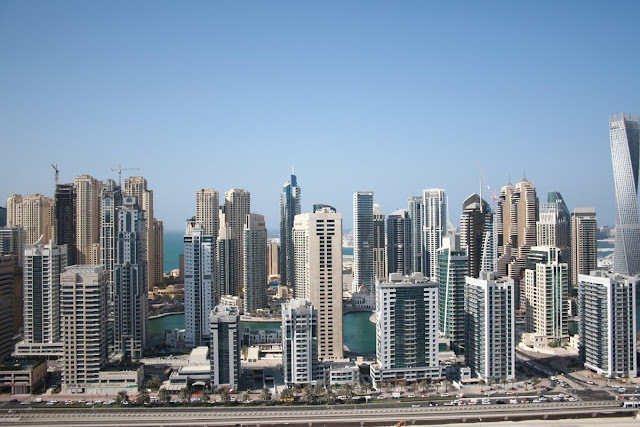 and is known for its nightlife, ultra-modern architecture and skyline dotted with skyscrapers. Yes, you guessed it right. Today's guest is joining us from Dubai and letting us take a peek inside her beautifully done home. 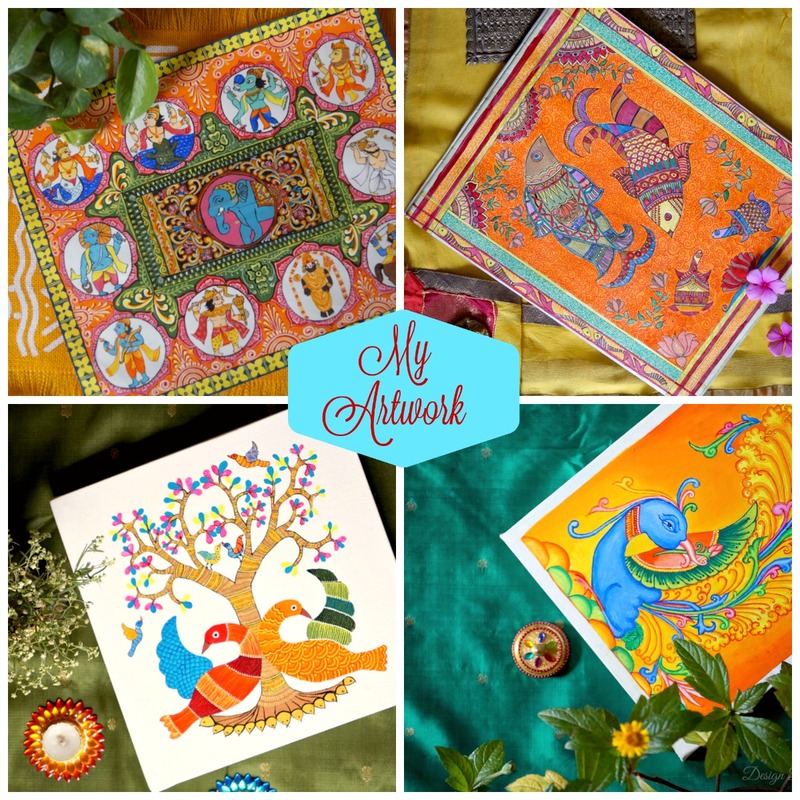 Dear Readers, Anamika is a multifaceted person. She is a family photographer who captures distinctive, candid family photos for her clients. You can take a look at her portfolio site Melanger Photography to know how beautifully she captures memories. She is a food blogger too who blogs at Taste Melanger and loves to bake in her spare time. She is an ardent follower of 3D and loves to decorate her nest in her own unique style. You can probably imagine the excitement and joy of moving into a new house and transforming it into a home. Anamika is going to share that joy with us today. 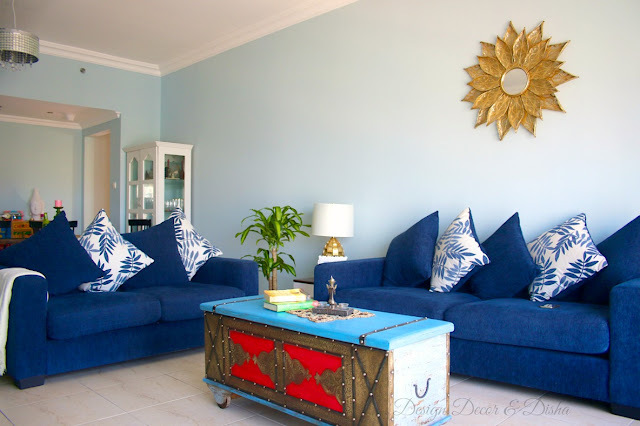 Here's a tete-a-tete with Anamika where she talks about how she decorated her only a month old apartment in Dubai with her distinctive style. Anamika: Serene, welcoming and stylish!! Anamika: We recently bought an apartment in Dubai and shifted here less than a month ago. Having our own place outside of the country felt special, and we were really excited to make this place into a cosy, welcoming abode. It’s a spacious 1650 sqft apartment with 2 bedrooms, study and store room. When we saw this place we were immediately attracted to the lovely view of the Marina and the sea. Being on the 29th floor, the night views are amazing. Secondly, we have a huge park right under our building which also ensures that our kids get their daily dose of outdoor playtime. 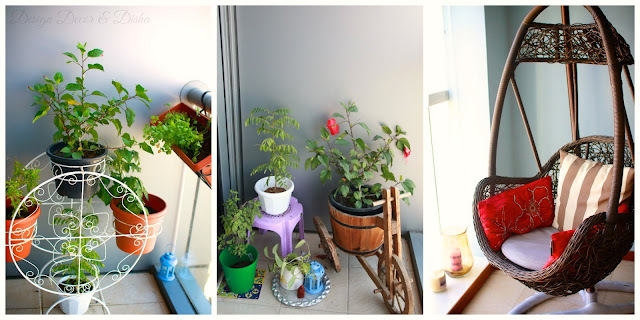 It’s not even a month since we shifted here, so there is a lot to do, to enhance; but I’m so glad that Disha is covering it up on her blog and showering the home with all the love. Hope you all enjoy the tour! Seen above is the image of Anamika's living room. I love how she plays with colours. She introduced red beautifully in her blue and white colour palette to break the monotony. 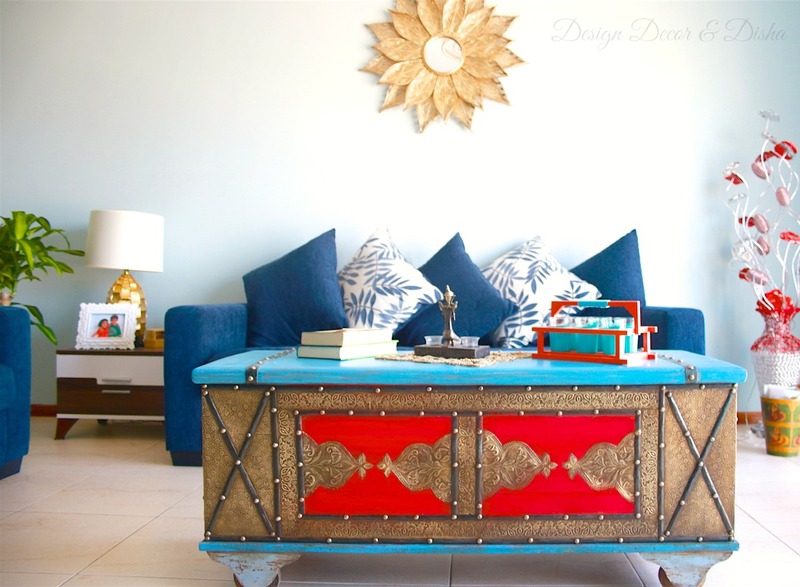 Clever use of antique trunk as a coffee table not only adding an elegant touch but offering functionality as well. Now let's know more about Anamika and her decorating style in her own words. 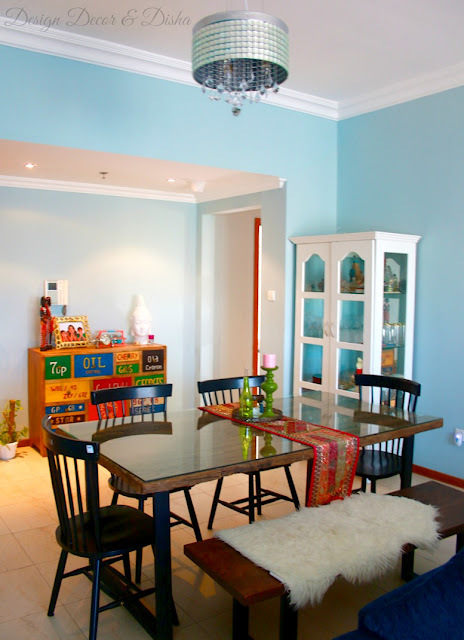 The other side of the living room serves as a dining room. Sleeper wood dining table is quite a statement piece here. Red table runner and candle stand in sap green blend well with the vintage chest at the other end of the dining room. White armoire with glass doors is adding French country cottage charm to the dining room in which Anamika proudly displays her collection of glassware. 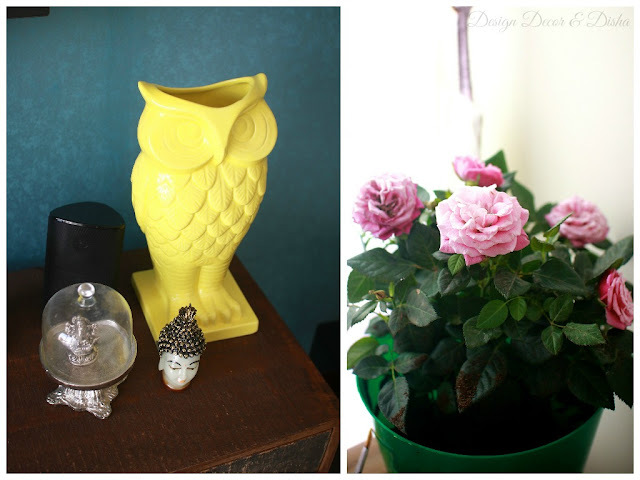 3D: What’s your decorating style. 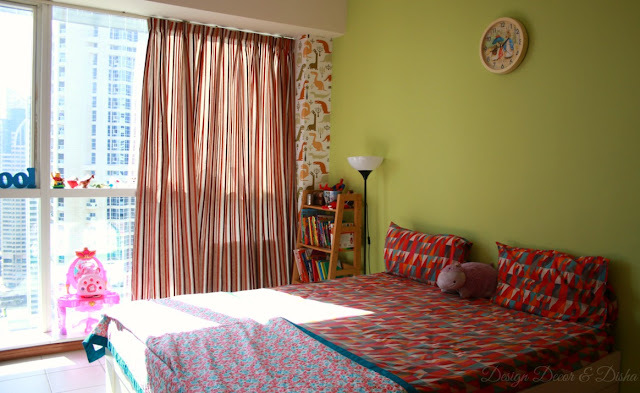 Anamika: I can’t really say that I have a particular decorating style since I like to mix things up until it feels right. But I do like a bit of quirky, lots of colours and stuff which has some character. Basically, all that which makes my home unique than the one next door. Else in the age of branded furniture stores, it's very easy to look alike. Also for me, a home has to have the warmth that welcomes you in..than just some expensive furniture kept together. 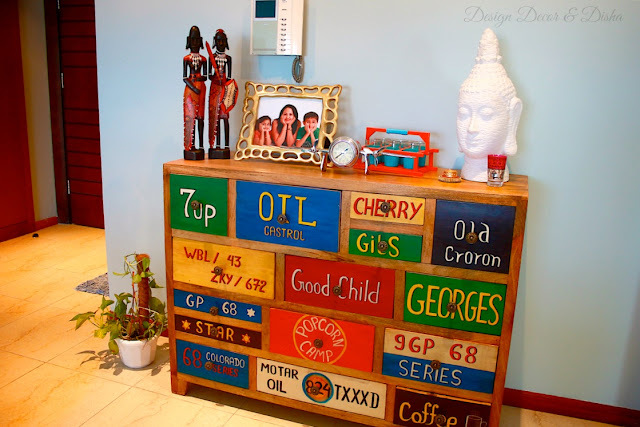 The beautiful and colourful vintage pop art buffet table is adding a joyful vibe with its cheerful colours and quirky texts.This buffet table sure is a perfect addition to the dining room to make it look 'Eclectic Cosy' and to define Anamika's unique taste. 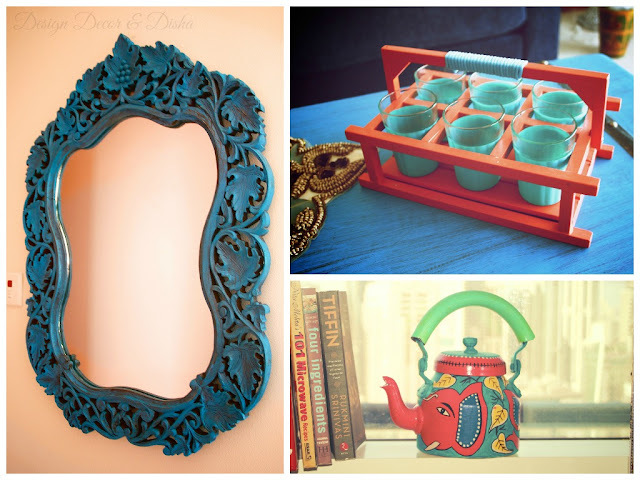 Below are some beautiful decor accents like grape vine carved wooden frame in a distressed finish to add old world charm and tea glasses and kettle in colour combination of teal and red for a kitschy look. 3D: Where do you get the inspiration from. Anamika: Like they say inspiration is everywhere - books, nature, blogs but above all Pinterest is a source that one can get lost into. So when I got a chance to decorate my new pad, I surely felt excited about it and had hundreds of ideas floating in my head. The challenge was to simplify the look, to evaluate it practically and to merge the likes of all family members. Like the blue textured tv wall in above image that my husband wanted..and then I planned rest of the things around in the room, to make it more cohesive. Or the neutral wallpaper and colour scheme that went for in the kids’ room to satisfy both my son and daughter. Colour palette in kids' room is fresh and gender neutral and also big on style. Pop of red and turquoise make the space come alive. You can never go wrong with the feature wall that displays kids' favourite creature Dinosaur. Overall feel of kids' room is cosy and great for both sleeping and playing. Here is what Anamika has to say about statement pieces she and her husband bought for their apartment. We went for solid wooden pieces for the furniture but wanted something which looked cheerful and wasn’t so heavy looking. So we ended up having quite a few statement pieces like the - antique chest which we use as coffee table, the vintage pop-art style buffet table which makes the whole room alive; or the sleeper wood dining table which adds lots of character to the dining space, or even the distressed office table in my bedroom which gives a good contrast to the modern comfy white chair. 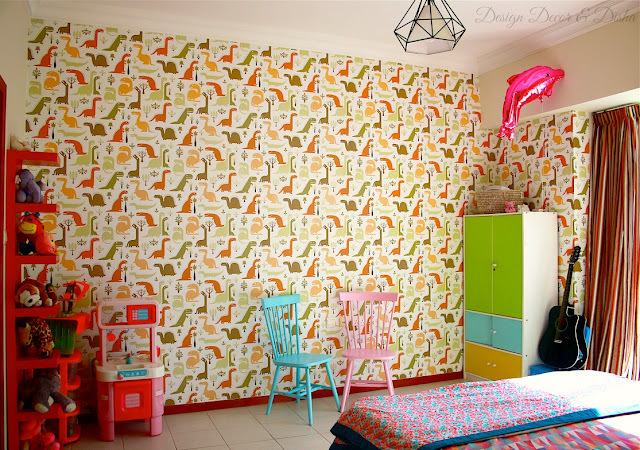 Even the ‘dinosaur wall’ is quite a feature wall that everyone loves in the kids’ room. 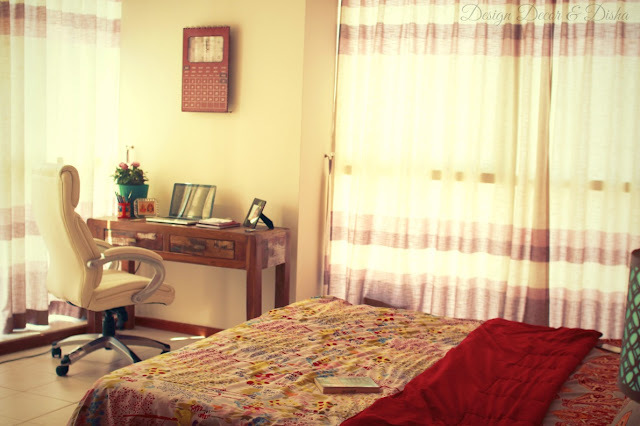 I really liked this study corner in Anamika's bedroom with a desk in distressed finish and dark tone. 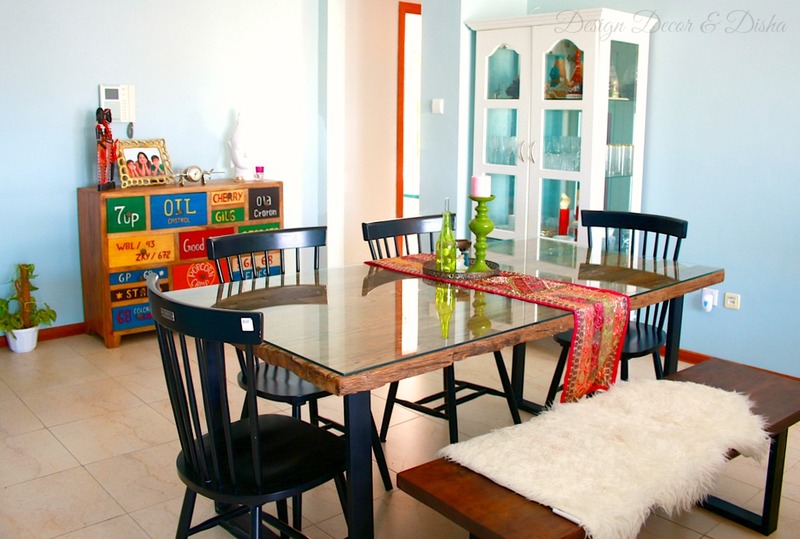 Ample light makes this spot perfect for reading or doing art and craft activity. Now let's ask Anamika about her fave spot in her home. 3D: Which is your favourite spot in your home and why. 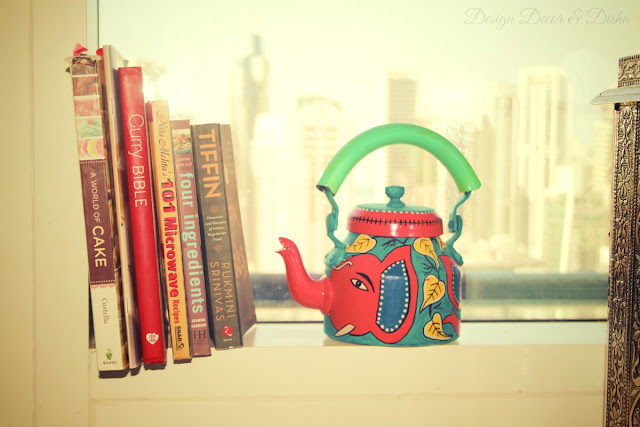 Anamika: One of my favourite corner in the house is the swing corner in my living room where I love to relax with a book and tea and enjoy the lovely view outside. 3D: Please give your valuable advice on home decorating to décor enthusiast 3D readers! 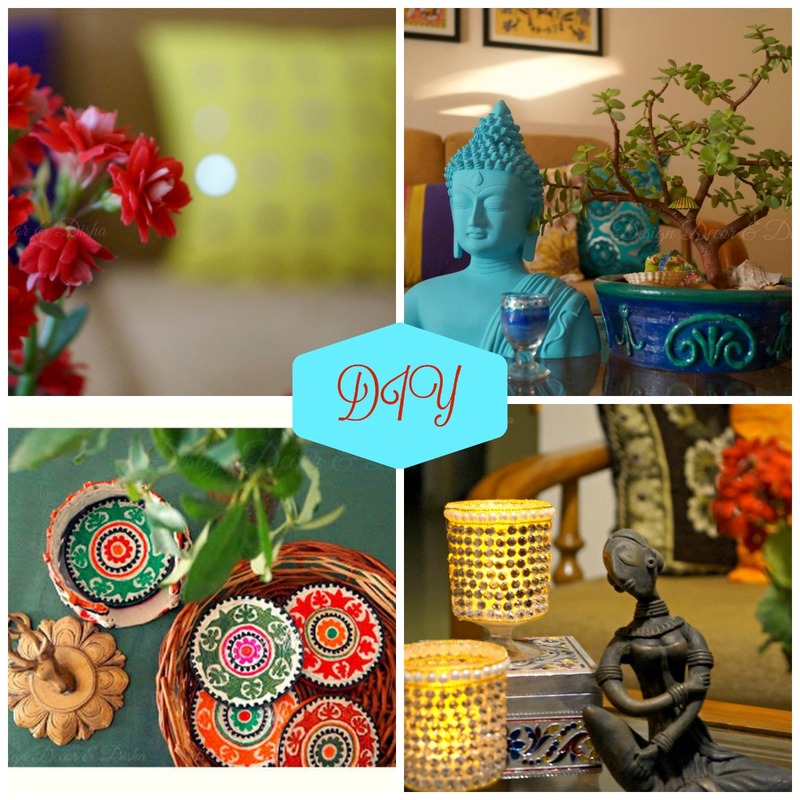 Anamika: Always go with what you like than what the trend is, or what decor experts say. After all, home is your space; so simply surround yourself with your favourite things and you would have a home you love. Try to visualise (if not creating a mood board) of the whole room or house, while picking furniture. As they say, a whole is bigger than the sum of its parts..so the bigger picture will keep you on track. De-clutter. de-clutter and de-clutter. 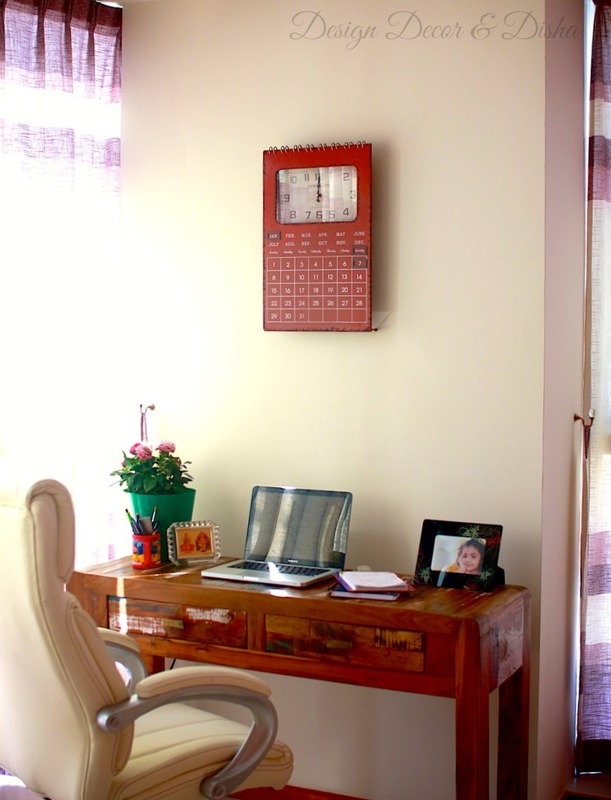 Clutter is the biggest negative element of the house..so keep it away. 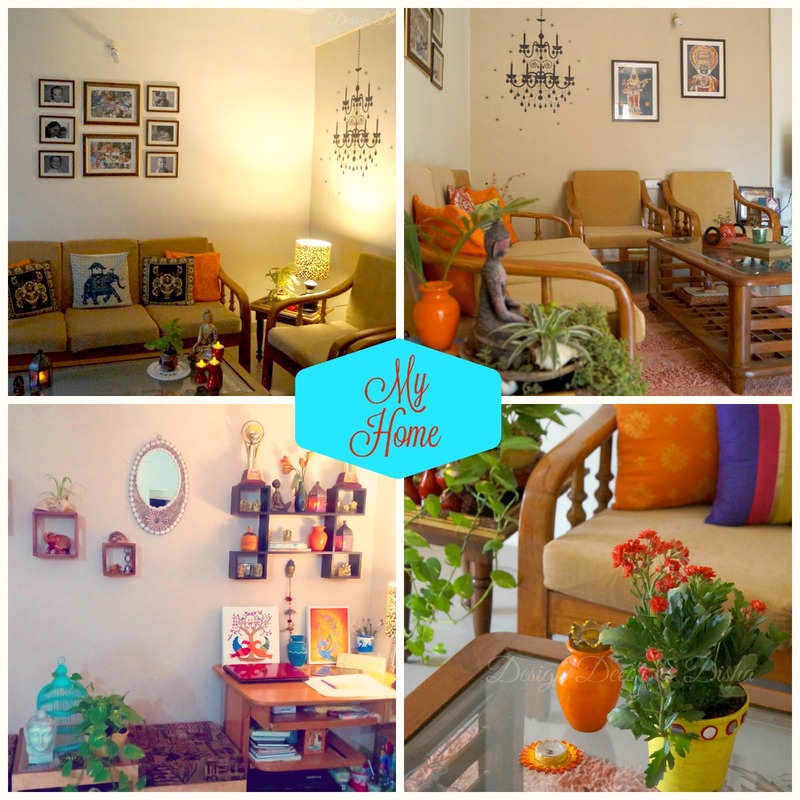 We just love having you on 3D Anamika, thank you so much for sharing lovely images of your abode with us. 3D wishes you all the very best for your future endeavours. Happy decorating!! Dear readers, if your decor thirsty eyes still looking for such eye candy images of beautiful homes then click here. Yes, I know now you are waiting eagerly to know what's coming up next. It's 'One Good Thing' for you so stay tuned!! P.S: All the images are Anamika's property and subject to copyright. Please seek permission of Anamika and 3D before using any image. Thank You!